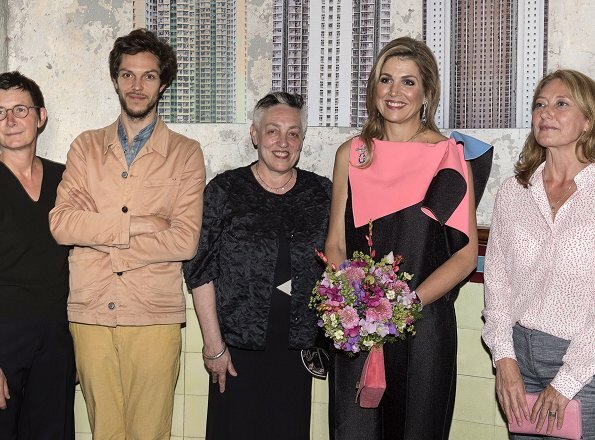 Dutch Queen Maxima attended the opening of the 70th edition of the Holland Festival at Westergasfabriek Culture Park on 3 June 2017 in Amsterdam. The Holland Festival is an international stage art festival that takes place each year in Amsterdam. Queen Maxima wore a jumpsuit by Roksanda Ilincic. I like the colours especially the contrast of the bubble gum pink against the black but I'm not completely convinced. The elaborate neck bit doesn't hang as well on Maxima as on the model. Her hair does not look good here - a hefty trim and a deep conditioning treatment are in order I think. Do you realise it is blue on the back? Yes, as I said the other day, a cut like Princess Charlene's and refraining from the bleach and chemicals while it grows would be welcome. Charlene makes it work. Il y a eu pire ! No, my hair, what there is of it at 80 years of age, doesn't always look good. But what's the use of wearing beautiful clothes and jewels if your hair is a mess? And she can get a hairdresser whenever she needs. No excuses for bad hair. Its a good thing that even queens can get bad hair days like every other woman :) But I've noticed that when you use products that suit your hair type, have good hair cut and regular trims, avoid over-process, eat healthy, then there are less bad hair days. But I can not agree that Maxima's hair never looks good. Her hair often look awsome and well styled. Its just that they are over-processed and in need of hefty trim. I think many of us agree with Lizzie, and I enjoy this blog for its candor and honesty. There are plenty of other blogs to follow if you're only interested in slavish, blind praise. Heel apart maar dat is ook alles. Niet flatteus.